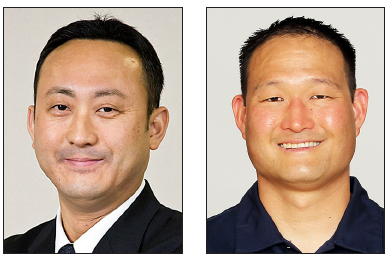 Yosuke Honjo (MBA ’98), president and CEO of ITO EN North America Inc., and Rocky Seto (’99, MPA ’01), assistant head coach, defense, for the Seattle Seahawks, will receive Leadership Awards at the 2015 USC Asian Pacific Alumni Association Scholarship and Awards Gala on Friday, April 10, at The Langham Huntington in Pasadena. In addition to Honjo and Seto, the USC Asian Pacific Alumni Association (APAA) will recognize three other outstanding members of the Trojan family. Sammy Lee, MD (’47), the first Asian American to win Olympic gold for the United States, will receive the Legacy Award, while Debbie Wong (’75) and Ben Wong (’73, Ph.D. ’78), dedicated alumni volunteers and USC parents, will receive the Service Award. “We’re hoping that this year’s gala will set a new attendance record and significantly increase our scholarship endowment. If you’ve never been to our gala, I urge you to join us for a special evening when we honor an impressive slate of alumni and student scholars,” says Karen Wong (’83, JD ’86), president of the APAA Board of Directors. Honjo leads ITO EN North America Inc., a division of ITO EN Ltd., Japan, the Tokyo-based beverage company with annual sales of $4.7 billion. He is also an advisor for Honjo International Scholarship Foundation (HISF), which provides scholarships to over 40 students every year. He has leadership roles in several public organizations, including the Japanese Chamber of Commerce and Industry and the Nippon Club in New York, and is also a member of the advisory boards of the Columbia University School of Social Work and the Metropolitan Museum of Art. Honjo is also an active member of the U.S.-Japan Council and a major supporter of the council’s Emerging Leaders Program. A former USC linebacker, Seto was named the Seattle Seahawks’ assistant head coach, defense, on Feb. 10. His organizational skills, on-field input and teaching methods have been vital to the Seahawks leading the NFL in average points allowed the past three seasons, and in average passing yards allowed the past two seasons. Seto had previously served in several defensive coaching capacities for the NFL team, which he joined in 2010 after 11 seasons at USC. Funds raised at the event directly benefit current and future USC students through APAA’s programming and scholarship endowment. For more information and to purchase tickets, visit http://alumni.usc.edu/apaa/gala2015 or call (213) 740-6035. The APAA supports the overall advancement of the university by engaging Asian Pacific alumni lifelong and worldwide, building a culture of philanthropy, providing meaningful and relevant programs, and serving as the representative voice for the Asian Pacific Trojan family.